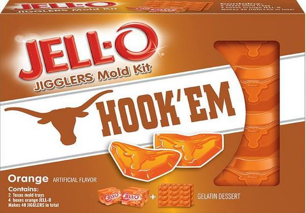 Jell-O Jigglers University Mold Kits are pretty much exactly what they sound like and just in time for college football season. Nonsense? Kind of. But marketing brilliance nonetheless. Going to frat parties, waking up feeling like you got helmet-to-helmet tackled by Ray Lewis, writing a term paper two hours before it’s due. These are all a part of the expected college experience. Notice I didn’t include Jell-O in there. Unless you’re downing the seventh Jell-O shot after national championship game, the two things aren’t typically in close association. But it looks like JelO hasn’t gotten the memo because they’ve unleashed a blitz of ads, college themed colors and even mold kits. That’s right, if your grandma’s holiday jello didn’t look enough like a Texas longhorn, now is your chance to make things right. Note: I’m not a fan of any of this jock business. Not to mention that I researched “pro-football” and found Ray Lewis’s name. Oh, for love of SEO. Speaking of jello shots, Kraft’s brand manager ‘answered’ whether this new push to colleges was with the alcoholic favorite in mind by saying: “We understand that this behavior might be popular among adults, but the Jell-O brand does not advocate [that] behavior and we don’t promote recipes that use alcohol.” Yeah, I’m sure. Anti-Alcohol groups in the south are already getting riled up but it really just gives the Jigglers more press. There must be some young blood in Jell-O’s product development department, because there’s nothing more enticing to a knuckle dragging college football fanatic than downing a gelatinous gulp of school pride mixed with cheap vodka. Save us the PR sidestepping, Kraft, I can see the dollar signs reflected in your eyes. Okay, back to my reality TV shows. This indeed is a good marketing gimmick. I don’t know much about Seo but it was interesting to read about it here. Thank you for sharing this post with us.